You must make reservations at least 5 minutes in advance of the time at Finfine. 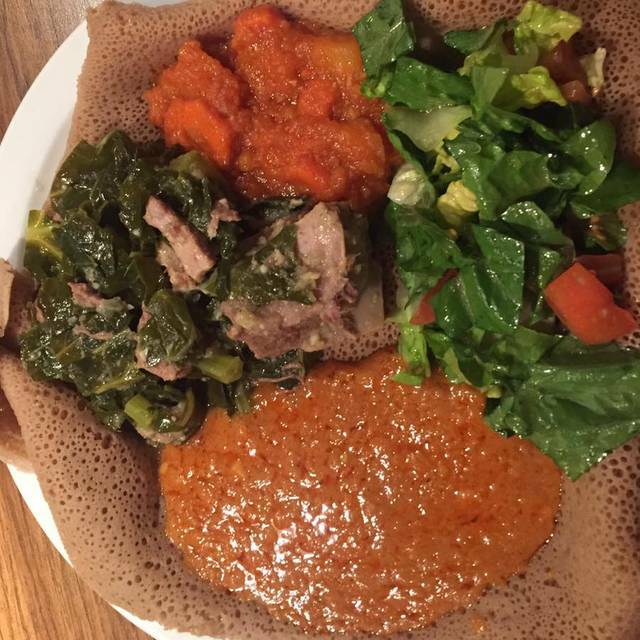 Finfine is an Ethiopian style restaurant in Berkeley, California with a focus on providing diners with healthy, tasty and spicy food. 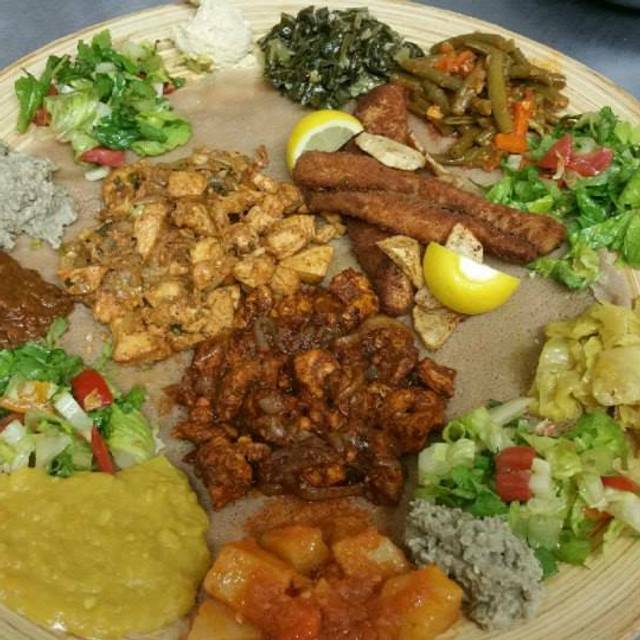 The restaurant prepares unique Ethiopian and ethnic dishes utilizing fresh ingredients from local organic farms. The menu at Finfine features an eclectic mix of appetizers, vegetarian dishes and meat and fish. Menu selections include such fare as highland salad, tsom firfir, gomen, shiro wat, lamb wat, assa tibs and gored-gored. Gluten free menu options are also available at the restaurant upon request. Finfine also offers a variety of drink options to guests including beer, white wine, red wine, tej-honey wine, soft drinks and hot drinks including coffee and tea. Delicious food and friendly service - it’s a family favorite restaurant. What a great surprise. Unassuming on outside but cozy inside. Owner gave great recommendation and presentation was fun. $7 a glass for a great Cab just highlights great value. Best Ethiopian in Berkeley! I love everything about it. One of our favorite restaurants ! Flavors are amazing. Just be aware that they charge a service charge on your bill which is the tip. Dont tip on top of the service charge. Ample space and great service. The food was ok, nothing special. Simple and healthy. The service was top notch. This is family run establishment and the warmth is felt in service and food. An intimate place which is proud of organic sourcing. The raw tuna was an interesting tweak on kitfo chopped raw beef. They have a few high quality tej honey wine selections I had not seen elsewhere before. The next time I get the jones for Ethiopian, I will return. Excellent kifto made with high quality meat. Seasonings in kifto and vegetation items were tasty, not just hot. Nice Ethiopian Restaurant close to UC Campus. This was a find. They have a nice varied menu of vegetarian, fish, lamb, chicken and beef and you can choose your level of spiciness. Even the medium is pretty spicy though. They serve it on the bread with pieces of bread with which to eat. All the food is excellently prepared. A plate includes salad and vegetable. The vegetarian platter is a veritable feast of many different things. Prices are reasonable and service is friendly. Street parking is available in the neighborhood, but might be more challenging on a Saturday evening. The food was amazing; so so good very flavorful and quality ingredients the service was wonderful too!! Great service excellent food. Disappointed that there was no dessert menu. We will be back. My only complaint is that there seemed to be fewer options on the menu compared with other Ethiopian restaurants I've visited. However everything we did order was delicious!! They might also consider offering a couple of desserts, even if strictly from this cuisine...a couple that are satisfying after spicy food. Great service! Great food!! Definitely coming back!!! Social and fun! Great food! The food was excellent, at a good price and the staff was friendly . . .
Food was great... staff was great... got our food quickly. My only complaint and this extends to all restaurants not just this one— when you order a starter, it should come before the meal. Not after and or at the same as the main meal. Otherwise why call it a starter. Very patient and knowledgeable staff. Great food! All three dishes we got tasted the same, they claim meat is tender on the menu, i am not sure i would call both lamb and beef dishes i had tender. The spicy sauce used on all the dishes is the best part of the experience but every dish has got it!! Excellent service, waitstaff very attentive to needs of customers. Great food, something new for me and quite good at that! Will be returning. This is our go to place for Ethiopian food. The food is wonderful, and the service is delightful. It is a great place for out of town people to experience something different. It is also a great place to go with a group as you eat out of one platter ( although you can have a separate dish if you want) and really get to know your group. Lots of fun for all and delicious. Interesting dishes and flavors. I really enjoyed the lamb stew. They pride themselves on using organic and locally sourced items. You will be eating without knife and fork (in case you haven't been to an Ethiopian restaurant before). What a delightful find-just off Telegraph Ave., and walking distance to Zellerbach Hall! Ethiopian food was a new experience for all 4 of us, and we were so pleased with the meal. Owner/chef welcomed us warmly, explained the spice blend (and adjusted it to our taste) and shared his passion for organic, locally-sourced ingredients. We were all very pleased with our meal and hope to return soon. Reserved a table but when we got there we were told there was no seating available?!?! We sat at the bar. We had a great time! Service was wonderful. Food was great! Excellent food! Flavors were amazing. Loved the varied fish options. Salmon was excellent. Lots of excellent vegetarian options. Organic ingredients definitely a plus. Portions were a little n the small side. Corkage fee was $8! Extremely reasonable. Would definitely go back. Returning to Berkeley after 18 years, we were disappointed to find that the Blue Nile restaurant we had enjoyed as students had closed. Finfine made up for it and then some, with the food being both better and more authentic. This isn't a fine dining experience, but it's better than your typical ethnic-restaurant ambience. Simple but pleasant-enough surroundings, capable service, and tasty, family-style Ethiopian food. Great place, great service...GREAT FOOD & honey wine. Enjoyed the delicious food and appreciated the organic food. Friendly, attentive staff made the dining very pleasant! A real find for vegetarian me!. Fresh and flavorful sampler plate, excellent service, warm, comfortable vibe. A dollar or two more than a few other places I have tried, but we'll worth it for the organic, more than ample servings (took half home for another meal). I will return. If you're looking for a casual restaurant with good food, FinFine is Fine! We often bring out of towners to Ethiopian restaurants. There are three on this stretch of Telegraph that we know of. FinFine is very pleasant and the owner courteous to his guests. 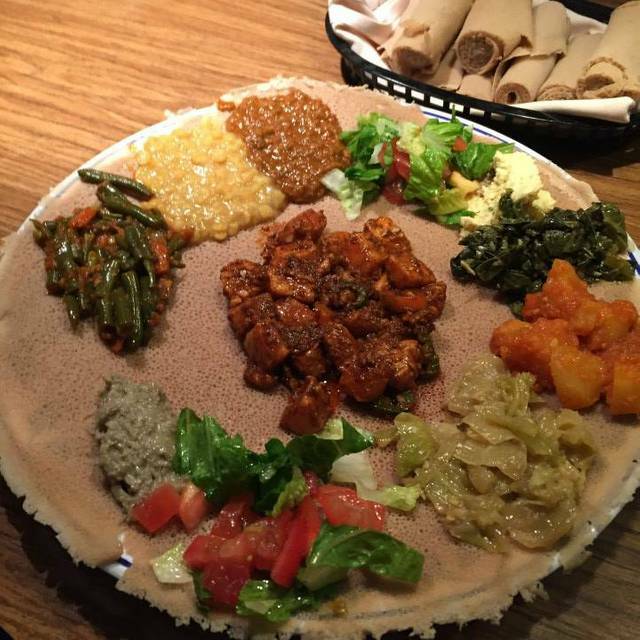 Every Ethiopian restaurant has a unique taste which makes the food fun to explore. We came to FinFine before a performance at Zellerbach. The service was friendly - the owner stopped by to talk with us and answer questions about the Ethiopian cuisine. The food is locally sourced and was delicious. Certainly something a little different for us, but we'll definitely return. Great food, fun experience. We ate dinner with our family then ran off to Berkeley playhouse theatre. Our first Ethiopian food, and we will be back! We loved the food & our experience at Finfine. The service was great & the staff very friendly. We will definitely be back. Nice to have an option of an Ethiopian restaurant that sources organic and (at least some) locally grown produce. And good quality fish!